"150 feet by 150 feet in distance in either axis"? Thread: "150 feet by 150 feet in distance in either axis"? Arrays shall be not greater than 150 feet (45 720 mm) by 150 feet (45 720 mm) in distance in either axis in order to create opportunities for fire department smoke ventilation operations. And then you have some additional options for ventilation requirements in addition to the above. Thoughts? What is being allowed or how is it being interpreted in your local jurisdictions (for fellow Californians)? 'Either axis' clearly means that the array can't be more than 150ft along any side. Otherwise it would say 'both axes' or something different. 40ft x 160ft is not okay. I haven't had the opportunity to test it with any AHJ, but I think you've gotten lucky if they allowed a 160ft long array. I've only seen it interpreted as a 150'X150' box, either axis can be less than 150' but neither can be more. I'm up for hearing how you get an AHJ to buy greater than 150' one a single axis. I agree w/ the above, it's meant to limit the size of a PV array to no more than 150' on either access. While we're on the subject of fire access and this section of the IFC, I would like to get some thoughts on the centerline access pathways denoted in 605.11.1.3.2.1 "The centerline axis pathways shall be provided in both axes of the roof." I understand the function and intent of this rule on a single-roof building, but I'm not clear on interpretation when designing on a building with multiple roof sections. 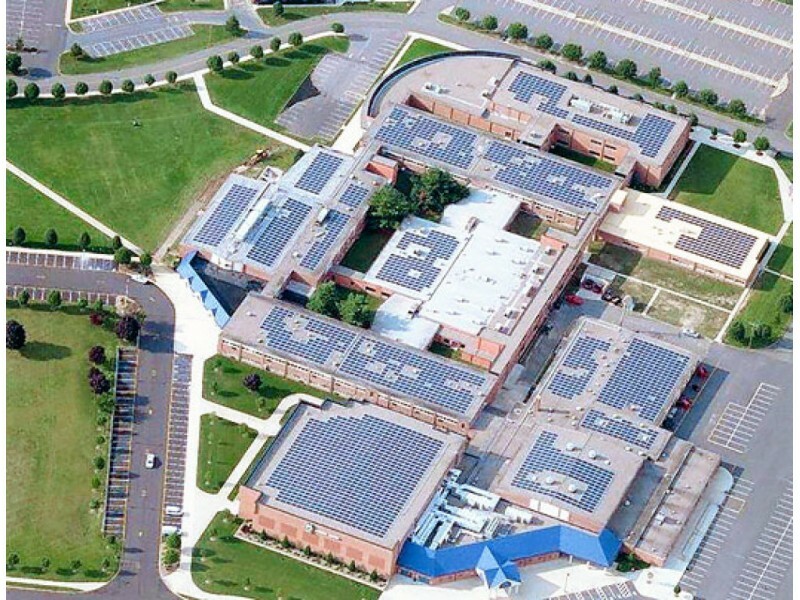 A typical example would be a school, where the building itself may have multiple smaller roof sections. Hive-mind interpretation? Centerline pathways when considering the building as a whole, or on each roof section? This would obviously have significant consequences for array layout, especially on smaller sections of roof. Here's a couple of examples (just based on google image search) where on first glance they followed setback (mostly) and max array size requirements, but clearly didn't provide centerline access pathways on individual roof sections. Functionally on these style of buildings, if the edge setbacks are followed for each roof individually (where there is more than a 6' delta and a fall risk is present), that should create plenty of walkways for fire crews in an emergency. Yes, the code is pretty much written as if there are only three types of roofs in the world: a single ridge residence, an all-hip-layout residence, and a flat-roof commercial building over 150ft in both axes. It leaves one guessing, or at least relying on previous experience with the AHJ, on about 90% of actual roofs. The centerline requirement is superfluous and should be deleted. The 150ft rule that is the main subject of this thread's original post takes care of it. Let's say I have a building that's somewhat over 450ft by somewhat over 150ft, such that I can have three 150x150 arrays in a line with proper setbacks and pathways in between. Why do I also need a centerline path? If fire fighters can fight fires around 150ft square arrays, then ... they can fight fires around them in any arrangement, as far as I can tell. As far as multiple roof sections, I think the rule should be based on the vertical separation. More than 3ft, or something like that, defines a different roof. The principle being that if ladders are needed to get from one to the other then a firefighter can't operationally be fighting the fire in both sections at the same time, and needs access around each section as if it were free-standing. Setbacks apply to any barrier between sections that exceeds the vertical allowance. 150ft rule still applies to an 'array' that bridges sections with vertical separation below the minimum allowance. In the first photo you posted it looks like they basically made that interpretation and put setbacks around all sections of the roof. In the second photo it looks like they played fairly fast and loose with the intent of the code to provide firefighter access, especially with regards to the upper section. The majority of the upper section perimeter is not suitable for a fire fighter to access via ladder from the lower section, due to insufficient setback. And the fire fighter can't see the few suitable spots from below, would need a spotter to tell him/her where to go. And one cannot walk from one side of the upper section to another side of it, at least without significant tripping hazard and fall risk. There's some questionable choices on the lower section as well, such as above that middle entrance where there's no setback. The point of perimeter setbacks is that firefighters shouldn't be put in a situation where they try to access a roof section in one location and find that it's impossible and have to move to a different location. They should be able to get to the roof pretty much anywhere they choose, and then, once on it and able to see the layout, they can figure out how to get where they might need to go on that roof. Something to keep in mind when designing across different roof sections with various vertical separations. Also keep in mind that for a pitched roof with a center ridge, the firefighter would really like to ventilate at the highest point if possible. Right, and that goes to my point about how the code assumes there's only three types of roofs in the world. If I recall correctly, the requirement for venting at the ridge applies to R-3 occupancies but somehow wouldn't apply to a large commercial building with a pitched roof. Because the code is written as if all such large commercial buildings have flat roofs. It's not very clear from the code how to treat roofs that are broken up. The ultimate source will be the local fire AHJ, ask them what they will need based on the building and their preference. Can't go wrong making friends with the local fire fighters. Another thing to keep in mind is that if the centerline path does not follow a structural support then it needs to be offset so it does. Fire fighters will not use a pathway that is not going to support them if there is a fire in the building.